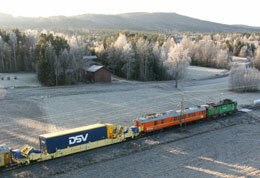 FlexiWaggon AB is owned by MD Jan Eriksson (80%) and approximately 140 shareholders. The development of the railcars has taken place with support from the Swedish Energy Agency in the form of a grant of SEK 11 million (US$1.6 million). 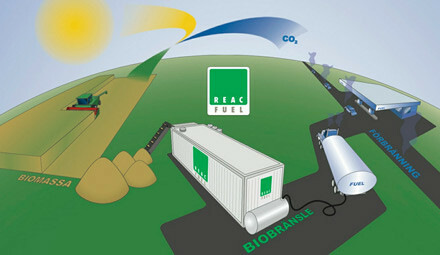 Other interested parties include ICA Sverige AB and Green Cargo. The vehicle drives forwards on and off the wagon. Loading or unloading a wagon takes six to seven minutes. The Swedish province of Jämtland is so sparsely populated that trees outnumber inhabitants. Approximately half of the region is covered in forest and built up areas constitute a mere one percent. It’s not surprising that many Swedes associate Jämtland with outdoor sports and camping. But there are also plenty of talented business minds, with numerous small companies and an overwhelming vision of sustainable development throughout the region. A significant number of entrepreneurs aim to develop products or services that contribute to environmental improvement. One of these is Jan Eriksson, CEO of FlexiWaggon AB, located just outside of Jämtland’s main city, Östersund. “It all started about 15 years ago when I stuck my head under the kitchen sink and started to think about how all this sorted rubbish was transported,” says Eriksson. “Here in Jämtland, it can be many miles before a crushed tin reaches its goal. I asked myself whether the number of road miles could be reduced if the rubbish trucks were to take the train for certain sections,” he continues. 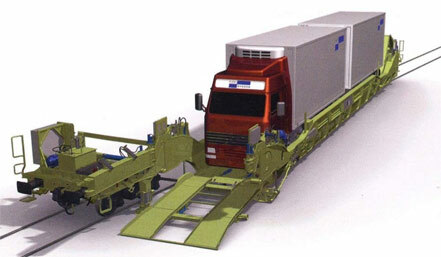 “I visualized a train carriage on which the rubbish truck could simply drive without a ramp or other expensive add-ons”. As it turned out, the concept would be suitable for most types of trucks and buses, as well as private cars. What resulted was not a train carriage specifically designed for rubbish trucks but instead Flexiwaggon, upon which an 18.75-meter truck could be loaded at the press of a button. Although the first prototype was ready back in 2000, there is no hiding the fact that the Swedish railway system is not flooded with Flexiwaggon railcars today. “When I first presented my idea, climate issues were not especially high on the agenda, nor were fuel costs so high. However, things are now beginning to happen. The food retailer ICA Sweden is showing great interest in the new concept, and the company has bought shares in FlexiWaggon AB,” says Eriksson. In November 2008, the latest prototype was test driven for two weeks carrying a fully loaded truck, and the results were positive. 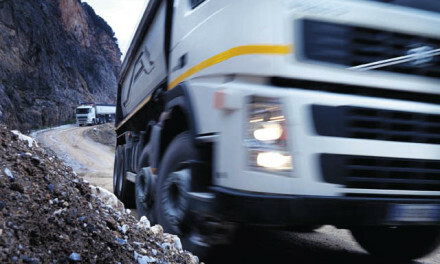 Fewer trucks on the roads result in fewer accidents and less wear on the roads. Carbon dioxide emissions and other air pollutants are reduced by approximately 75 percent. Flexiwaggon does not require any special ramps or terminals, which results in a flexible transportation solution. For the haulage companies, transporting vehicles with Flexiwaggon reduces costs. Fuel costs are lower, wear on vehicles is reduced and personnel costs are trimmed. The driver does not need to accompany the truck. Instead, another driver at the end destination can collect the vehicle. According to FlexiWaggon, transport costs are as low as US$8.75 per 10 kilometers, about half the cost of road transportation. Other synergy effects can come as a result of reduced costs for stock-keeping as well as time-consuming loading. Transport costs using FlexiWaggon are as low as US$8.75 per 10 kilometers, about half the cost of road transportation. The FlexiWaggon railway wagon transports trucks, buses and private cars. Each wagon is individually loaded and unloaded, and this can take place almost anywhere. The only requirement is a firm surface close by the track strong enough to support a loading or unloading vehicle. The driver loads the vehicle on and off with just two presses of a button and drives up onto the wagon via a collapsible ramp. The loading area can be opened both at the front and back and can be turned to the right and left. The vehicle drives forwards on and off the wagon (no need to reverse) and loading or unloading a wagon takes six to seven minutes. An entire train set can be loaded in 10 to 15 minutes. The driver can choose to travel with the train or leave it to another driver to pick up the vehicle. The transport companies choose the departure and arrival destination for each vehicle and, in between, make best use of this combined road and rail transport solution. Flexiwaggon can load 50 tons compared with 44 tons for a comparable system. With its low loading height, a fully loaded wagon can be driven up to 120 km per hour. So what happened to the original idea about rubbish trucks being transported on the railways? 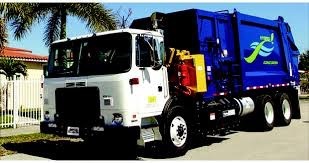 The city of Los Angeles, California is interested in using Flexiwaggon to transport waste to landfills in the desert. FlexiWaggon representatives have met with the head of Indian Railways to discuss how the concept can be introduced into that country. The Indian market for heavy trucks is the fourth largest in the world and the potential for eco-friendly transport solutions is great. A number of other countries are also showing interest in this combined use of road and railway transport. So does Flexiwaggon have any disadvantages? According to Jan Eriksson, function tests have not revealed any serious teething problems. An argument sometimes heard against Flexiwaggon is that the length of the carriage is such that it cannot drive on all track routes—a characteristic shared with about 70 percent of the railway carriages on the Swedish railway today. The company’s CEO does not believe this to be a problem that will seriously limit the use of Flexiwaggon. “The next step is to obtain additional capital so that more wagons can be produced, and to strengthen the company’s sales department”, says Eriksson. “Building a wagon is an expensive process and we need a train set to be able to demonstrate the system’s full capacity.” So where are the railcars to be built? FlexiWaggon is considering an eastern European country as a likely production site for the Swedish market. Wagons for the Indian market would be produced on-site in India. At two informal meetings in Sweden during summer 2009, a busload of delegates took the train on board Flexiwaggon from Östersund to Åre in the north of the country. It was the first time a bus with passengers had been transported in such a way. Flexiwaggon remained on display during the entire energy and environment conference and sparked great interest from the participants.